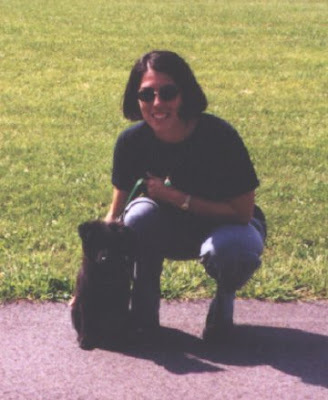 I just realized that I never blogged about Dave’s and my first baby, Howie. 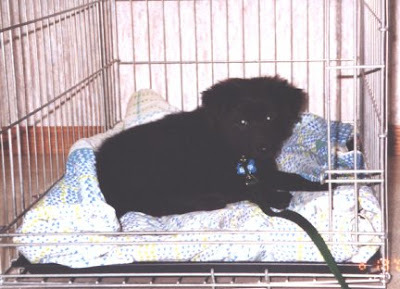 The day we got him, he had to wear the leash for about 24 hours straight and the crate was his home for the first 18 months or so. We were hoping for a big, Lab-sized dog with Lab-length fur, and we ended up with something closer in size and fur to a Border Collie. Howie is a very calm dog, rather quiet, and chasing rodents is his #1 downfall. 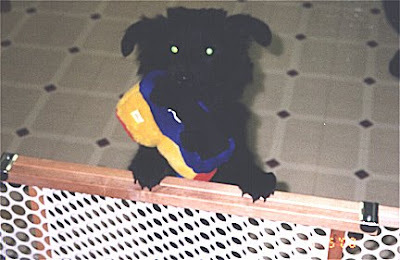 This is the scene that Dave and I faced when we’d head out the door to school in the morning…Howie with a toy in his mouth, making us feel SO guilty for leaving him for a few hours. 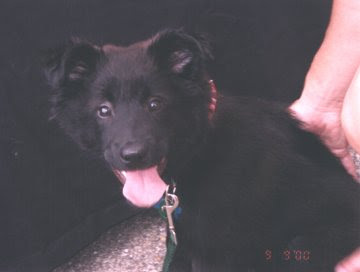 Before we had human babies, Howie was the one we would spoil at Christmas, he’d come with us everywhere, and before the quarantine rules changed, we were even convinced that we didn’t want to get stationed in Hawaii, we couldn’t bear to have to quarantine Howie for a number of months! 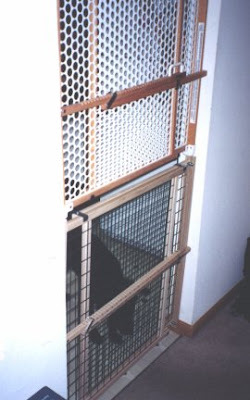 Howie would jump the gate when it was just one gate, so we had to use two baby gates. Howie is the most laid-back dog you’ll ever know. In fact, he’s more like a cat in so many ways! He enjoys sitting at a window looking out at the world and he’s a very picky eater. He doesn’t play with toys the way other dogs do — Howie has his favorite stuffed dinosaur and bunny rabbit (from his puppy days) but otherwise he enjoys chasing squirrels in our backyard, and nipping at loose pant legs. 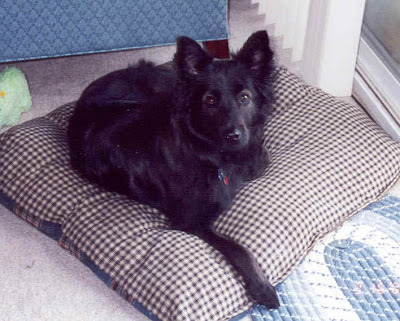 Howie lounging on his “Civil War” dog bed, which I made from leftover material from reenacting costumes I’d made. Howie (left) playing wth his two dog friends in Florida, Jerome (right) and Moxie (top). We 3 families would trade around dogsitting in FL. This was in Florida, but Jerome and Moxie are now in Ohio. Over the years, Howie has had to take a back seat to the boys. I feel badly at how often we have to leave Howie out of a family outing because having the boys with us was enough trouble. Howie was subjected to years of having toddler boys around, each of our boys had a good 18-24 months of “Don’t pull Howie’s tail!” or “Don’t sit on Howie!” or “Please leave Howie’s dog food alone!”. 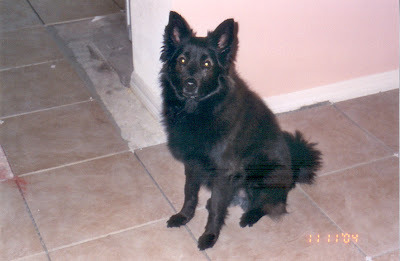 Howie is keeping an eye on the construction workers while we had tile floors put into our FL house, late 2004. This past summer, just before we left North Carolina, we took Howie for a checkup and our vet deemed Howie a “senior dog”. Howie had put on some weight in North Carolina, and he had the worst allergies…his gorgeous coat was definitely compromised while we were living there. I wanted to cry at the thought of our first baby now being a “senior”. One of Howie’s favorite things to do, chase the hay wagon at the Vollmer family reunion! So here are some pictures of Howie for you to enjoy…when I talk about how much I’m going to miss my boys when deployed, Howie is among my boys!